Today's Image of Mars is a close-up view of the layered deposits near Mawrth Vallis, a channel that was most likely carved by water at some point in the past. The varying tones of each layer is likely reflective of differences in mineral content. The dark patches that you see on the layers are sand dunes. CRISM has detected clays in the Mawrth Vallis region, so the layers may be rich in clays. Clays are another indication of past water on Mars because they are only known to form by interaction with water. Needless to say, Mawrth Vallis has consistently been a landing site candidate for proposed missions to Mars. 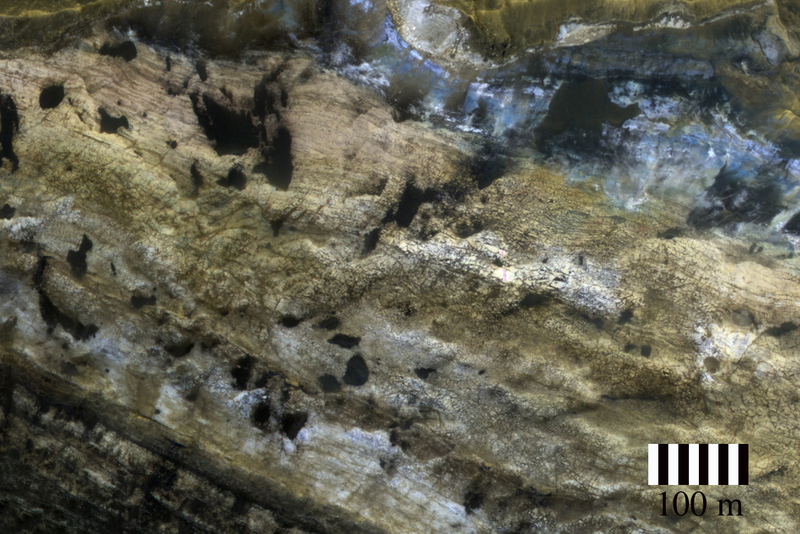 This image is a subimage of a larger, captioned image by HiRISE, which you can view by clicking on this image.